Ttariff is a restrictive measure which seeks to control the quantity of import so that, domestic industry may be protected.Tariffs increase the prices of imported goods. Because of this, domestic producers are not forced to reduce their prices from increased competition, and domestic consumers are left paying higher prices as a result. Tariffs also reduce efficiencies by allowing companies that would not exist in a more competitive market to remain open. Figure 1 illustrates the effects of world trade without the presence of a tariff. 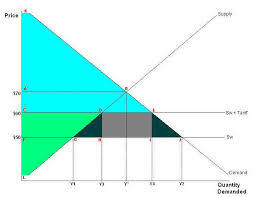 In the graph, DS means Domestic Supply and DD means Domestic Demand. The price of goods at home is found at price P, while the world price is found at P*. At a lower price, domestic consumers will consume Qw worth of goods, but because the home country can only produce up to Qd, it must import Qw-Qd worth of goods. 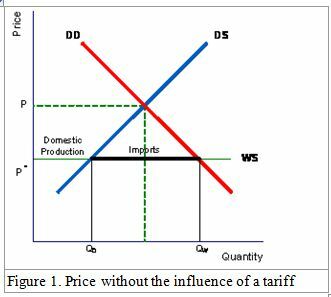 When a tariff or other price-increasing policy is put in place, the effect is to increase prices and limit the volume of imports. 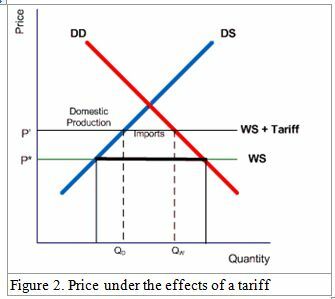 In Figure 2, price increases from the non-tariff P* to P’. Because price increases, more domestic companies are willing to produce the good, so Qd moves right. This also shifts Qw left. The overall effect is a reduction in imports, increased domestic production and higher consumer prices. The role tariffs play in international trade has declined in modern times. One of the primary reasons for the decline is the introduction of international organizations designed to improve free trade, such as theWorld trade organization (WTO). Such organizations make it more difficult for a country to levy tariffs and taxes on imported goods, and can reduce the likelihood of retaliatory taxes. Because of this, countries have shifted to non-tariff barriers , such as quotas and export restraints. Organizations like the WTO attempt to reduce production and consumption distortions created by tariffs. These distortions are the result of domestic producers making goods due to inflated prices, and consumers purchasing fewer goods because prices have increased. Since the 1930s, many developed countries have reduced tariffs and trade barriers, which has improved global integration, as well as brought about globalization . Multilateral agreements between governments increase the likelihood of tariff reduction, and enforcement on binding agreements reduces uncertainty. Free trade benefits consumers through increased choice and reduced prices, but because the global economy brings with it uncertainty, many governments impose tariffs and other trade barriers to protect industry. There is a delicate balance between the pursuit of efficiencies and the government’s need to ensure low unemployment. Training And Development on Employees Performance at Mcdonald’s Restaurant Ltd.